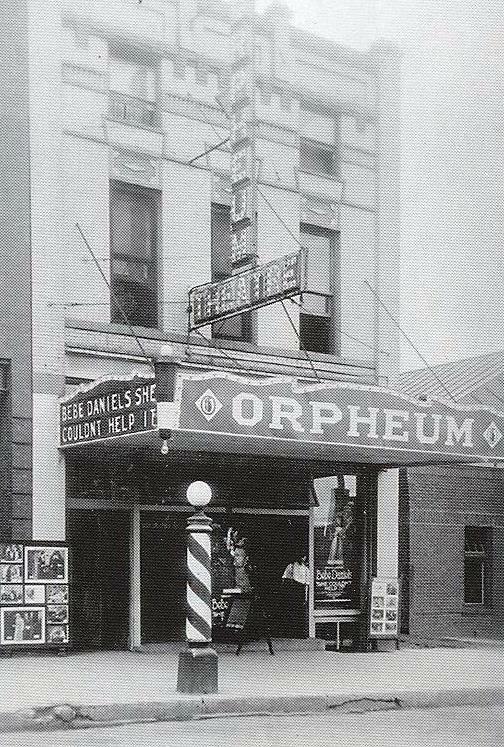 Entertainment – If one wanted to watch a movie there was the Orpheum Theater, The Strand and The State. In 1952 the Empire opened. Admission was a quarter and a bag of popcorn was a dime. For more adult entertainment and refreshments there were a number of bars in Downtown Minot. There was the Brown Derby, The Buffalo Tap, Brady’s, The Covered Wagon, North Main Tavern, The Terrace, The Grand Tavern, Lee’s, The 13 Club and Vaughn’s . Downtown Minot provided all ages with some sort of entertainment in 1950. Restaurants – In 1950 there were close to 50 eating establishments in Minot. Those in the Downtown area on Main Street included The Victory Café, The Union Café, Gimbles, the Ameerican, LaPlaza, Nellie’s and the Uptown Nook. Others were The Cut Rate café, Woolworth’s, Kresge’s, Arvids Red Carpet, The Bus Lunch, the Pantry, and Nagatomo’s. There were others along Central Avenue and on 1st Street. One would not have to worry about going hungry in Downtown Minot. In most places a2 bits or a quarter would buy a burger and something to drink. Things are moving forward. The carpet is installed in the bedroom. The new bed and bedroom furniture was delivered on Friday. Base moldings are in place in the rest of the bedroom area.... dressing room and hallway. Tile is installed in the bathroom. the base moldings for the bathoom and den are stained and almost varnished. I will be installing the bathroom base moldings tonight. Plumbers are back tomorrow and will begin installing fixtures. we need a toilet as all the porta-potties have been removed from the neighborhood. The electricians will be back this week to hang fixtures and finish off the outlets and switches. Flooring will hopefully be installed in kitchen, den and rest of the bedroom area this week. 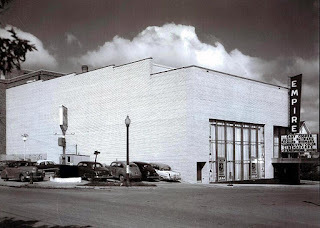 Department Stores – In 1950 a number of department stores were open on Main Street. Woolworths was listed as the 5 and 10 cent department store. Kresge’s was just up from Woolworths, carrying merchandise from 25 cents to $1.00. Other department stores on Main Street included Sears, on the north end of Main Street, Montgomery Wards, a favorite meeting place, J C Penny on the corner of 1st Avenue and Main , S & L on South Main, featuring trading stamps, and Ellison’s on 2nd Avenue and South Main. The first Piggly Wiggly Store opened in the mid 40’s at 213 South Main Street. In 1957, at a cost of $300,000, Piggly Wiggly opened a new store by the Fairgounds. Piggly Wiggly East was one of the largest grocery stores in the state at that time. 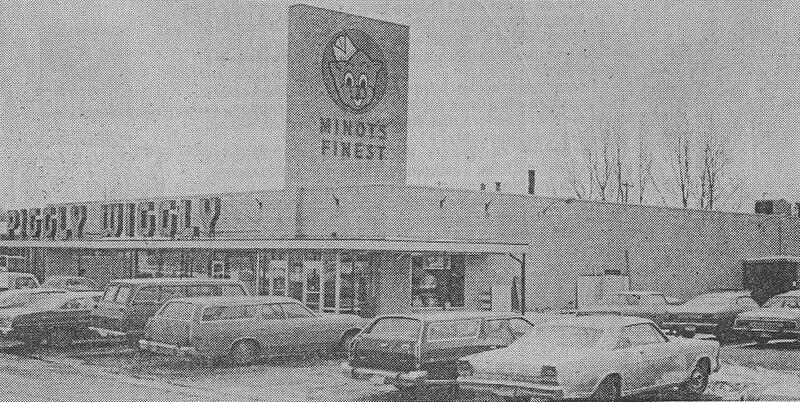 In 1961 another store opened in the Oak Park Center. The store on Main Street closed in 1960 and shortly after a third store was opened in the Town & County Center. In 1982 the Oak Park store moved to the Arrowhead Shopping Center. At one time Piggly Wiggly employed over 250 people. I worked at the Town & Country store in 1966-67. I started at $1.25 per hour, soon got a raise to $1.32 and shortly after the minimum wage increased to $1.40. Gas was about 25 cents and I was “rolling in the dough”. Liquor Raid – Destruction Device – at 32 Central Avenue East a device had been constructed so that liquor packed around it would be destroyed by fire when the current was on. The device consisted of a small wire coil in a concrete enclosure. Around the coil were shavings and other flammable material. Mixed in with this were the bottles of liquor. When the current was turned on it would ignite the material and heat the bottles enough for them to be destroyed thereby eliminating evidence. When agents barged into the room, they unplugged the device. The bottles had not heated up enough to explode and destroy the evidence. This past weekend we turned on the furnace. It is almost finished. The guys putting it in set it up so it runs off the main floor thermostat for the whole house. The zoning system is in but the dampers for the various areas need to be set up. We are working on new baseboards for the bedroom and den. The carpet installer will get carpet in this week, we hope as we have a new bed and bedroom furniture to be delivered on the Friday after Thanksgiving. New dest and bookcases for the den are ready to be delivered as soon as the flooring is installed in the den. Main floor bathroom needs flooring and then the plumbers will install all fixtures and we may have a bathroom. We are going to add a sink to the furnace/workroom. We need someplace to clean up paintbrushes, etc. Getting close to moving in day. Liquor Raid Evidence – A heavy door from one off the raided establishments was removed from its hinges and brought into the courtroom. It has “three thicknesses of lumber and 5 locks” . Officers were impressed by its durability. Also found were hundreds of empty liquor bottles, pretzels and small glasses. Slot machines were also found in some establishments and many Canadian product labels. This led the authorities to believe that the liquor was produced locally and falsely labeled as being Canadian. The original Third Street, or the area of ill repute was 1st Street SW, from Central Avenue south. The town was much younger and much smaller in the early days. The city fathers decided to move this area of ill repute “way out of town.” They moved them about 2 blocks to the west, by today's standards, to its Third Street Southwest location. Its good they moved them to Third Street as Second Street eventually became Broadway. One of the first Madams on Third Street was May Butler. She was located on the west side of the block between Central Avenue and 1st Avenue SW. May Butler was also active in the new area or what was to be known as High Third. Cars of the Third Street Men– Lincolns, Cadillacs, Imperials and other big luxury cars were the favorites of the Third Street Men. One of these men had a 1956 Imperial hard top that he had stored in the Stearns Building. At one time he owned a big and fancy Lincoln Continental. Rumor has it that the car was stored at Stearns Motors and he hired someone to go to the garage twice a day to dust the vehicle so it always looked good when he wanted to drive it. This person later started driving Oldsmobile Toronado’s.. Another Third Street Man had a 1958 Chrysler Imperial. He also had a pet dog which was a Boxer. The dog was very protective of the car. Beware to any who got too close. LAst night when Pat and I left about 6 pm, the kitchen cabinets were almost all installed. They look great.... have to down load pictures off the camera to upload to the sight. All the tape and plastic is off all the windows except in the kitchen and the arch way between the living room and dining room. The old strom door will work with the new back entry door so we will install and have a lot of cleanup to do on it in the spring. Today or tomorrow work should begin in the basement bathroom on the shower and the floor. Hopefully the flooring can start going in this week so new furniture can be delivered next week. About 4 inches of snow last night. Driving in from Tom and Susan's place this morning at 4:30 am was almost a white out. No wind, but heavy snow and no tracks on the road. Speed was about 10-15 mph until we got to the bottom of Speedway Hill. Very slippery underneath the snow . For those familiar with Minot..... 3rd St by the Courthouse was closed as was the hill on Hiawatha. Lots of multi vehicle accidents all over town. Ladies of the Night Shopping. 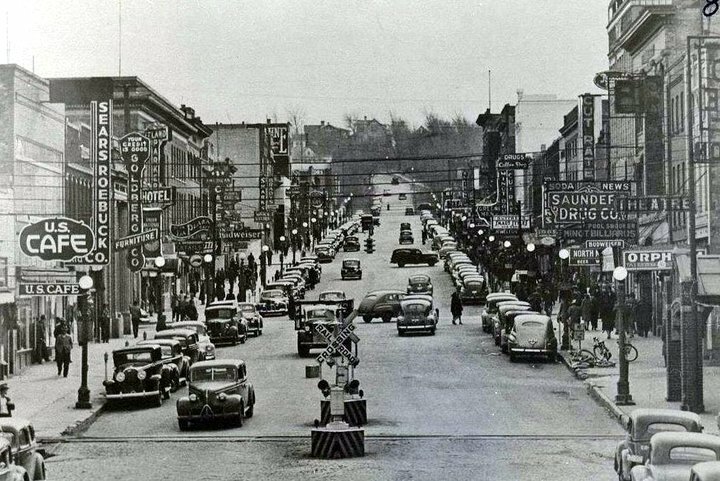 – the ladies of Third Street were regular customers at many of the best clothing stores in Minot. They had their own shopping time. 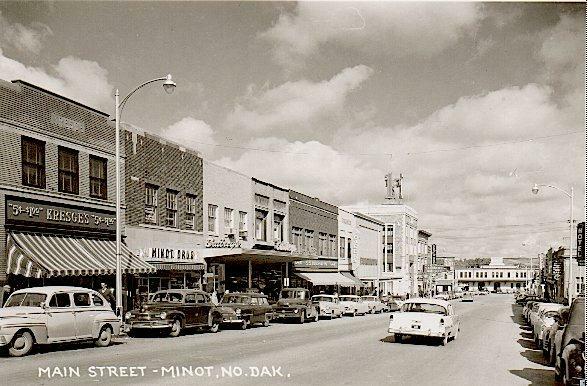 Years ago, all the stores in downtown Minot were open every Thursday evening until 9:00 pm. Since the stores were open later in the evening they would open later in the morning, on Thursdays. Many of the stores like S&L, Bader’s and others would open between 8:00 am and 10:00 am just for the Ladies of Third Street to shop. They would always pay in cash and were always done shopping by the time the stores opened for regular business. The Ladies of Third Street would spend a lot of money and did not disturb the regular shoppers and could shop in peace. The Main floor is painted. Cousin Susan and husband Tom spent Saturday and Sunday afternoon painting all the walls on the main floor. No wall paper this time. The kitchen cabinets arrived on Friday afternoon and if all goes as planned they will be installed today and tomorrow. The basement floor in the furnace room has been poured with new concrete and should be dry in a few days. The new back door has been installed and we will see if the old storm door will work, or if we need to buy a new one. Pat and I are going to the house late afternoon and tonite to remove all the tape and plastic covering the windows...... Things are progreesing. This individual controlled what happened on Third Street. Because of his control over the Third Street area, things were rather peaceful. The area pretty much was self policed. One of the local, well know individuals on Third Street, we will refer to him as Jim, had an altercation with the “Mayor”. The “Mayor of Third Street” looked at Jim and told him he had until evening to get out of town. Jim left town and went to Winnipeg. Jim did not return until the “Mayor” died.. This occurred on a hunting trip. The “Mayor” and a number of his cronies were out hunting and drinking. The practice was to have someone sitting on the front fenders of the car as they drove along looking for game. They group was driving down a corn field looking for pheasants. When they got to the end they noticed the “Mayor” was not on the front of the car. He was lying in the field. They had run over him breaking both legs. His friends took him to town and to the hospital. He died within 2 days due to an infection. After that, Jim was able to safely return to Minot. Today the texturing shoould be done on the main floor. We will be picking up the paint for the main floor today and if all goes well, we will be painting this weekend. Flooring will start going in the middle of next week and then we will get the electricians back to do the final install of outlets, switches and fixtures. Cabinets for the kitchen will arrive today sometime. We plan on putting them on the front porch until the painting is done. They could be installed early next week. Plumbing will be next. Getting closer to "move in" day. I ordered the cabinets for the Laundry room and work room yesterday. Those shoould arrive by early December. Prohibition - Raids on 3rd St.
Woman in the Cupboard – Back in the 50’s, as the story goes, there was a raid on one of the houses on Third Street. One of the women in the house was found hiding inside a kitchen cupboard. She had crawled in and shut the door, hoping to avoid being found. This was a bit unusual as most of the time the establishments in Third Street had advance warning of pending raids by the Police Dept. When the Police Dept was located on 1st Avenue in downtown Minot, it was in the same building as the fire dept. and City Hall. Some of the firemen would watch for unusual activity in the Police Dept and if it was a raid on Third Street, they would call and warn the Third Street businesses. Usually no one of importance was caught in the raids, however many prominent people in Minot would frequent many of the establishments. Because they establishments were usually warned when the raids were about to happen some speculate there was really no need for escape tunnels. It is well known that many of the High Rollers of the day would often hold high stake poker games. Many a car was lost and many won over a deck of cards. One of the Bootleggers always claimed the Cadillac’s or other cars he won from a well known auto dealer, always ran better than any he had purchased. He claimed that he won as many cars as he had lost. This same Bootlegger had at one time won a house on Third Street in a poker game. He also lost it in a poker game. Before he lost it in another poker game he hired someone to clean the house so he could turn around and sell it. As the cleaning person was clearing out a closet in the basement, she fell through the closet floor into a sub basement below the actual basement. One can only speculate what the lowest level was used for. Yesterday we officially have a functioning furnace and air conditioner. However... at the advice of the MDU tech and our furnace installer we are not going to turn it on untill all the sheetrock taping, sanding and texturing has been completed. Too big a risk of dust getting in and clogging things up. The six small ceramic heaters are maintaining an inside temp of 69 degrees. The main floor is almost all mudded and about 1/2 is masked off in preparation for the texture. They masking will stay so it is in place when we start painting, hopefully by this weekend..... Kitchen cabinets could be here this week. The kitchen will be painted first to allow for cabinet installation. We are getting into the finishing stage and out of the construction phase. In a report to a federal grand jury in Fargo on October 6, 1920, Judge Charles Amidon reported that there are automobiles loaded with liquor in convoys that have men armed with rifles and sawed off shotguns. He was encouraging the jurors to enforce the law. The “whiskey sixes” would run to Canada and back in the late spring through the fall, until the snow came. They did not run in the winter due to the danger of getting stuck in snow or mud, also the cars would be easier to follow. The price paid to the runners for running from their start to Canada and back varied. The amount ranged from $100.00 to $500.00 per trip. A lot of money was made in a very short time if you wanted to take the risk. Well, the preliminary flood controll plan for Minot and the Souris Valley is out. If you want to check it go to this website---- www.mouseriverplan.com. Click on the maps tab and a variety of maps covering the valley are available for viewing. Eastwood Park and our home are safe. The new plan would run along Central Ave. on the north side of Eastwood Park. Much of Roosevelt Park, the Minot Golf Course and The Country Club are in the greenspace, between the dikes. Erik, our son, has a house that will be covered by a dike the way it looks now. Public meetings will be held next week and the final plan will be "set in stone" by sometime in February. Booze Runners - The runners carried heavy loads in the “whiskey sixes”. Where the roads were good, the cars could travel along at speeds as fast a 50 to 60 miles per hour. The runners would travel in a line, or group with the lead car posing as a tourist to flush out the lawmen. The lead car would stall on the road, warning the runners that the law was ahead so they could make their get-away. Another trick used by the runners was to have a woman companion and at times a woman driving the car. The thought being that the lawmen would hesitate to shoot at a car occupied by a woman. It was generally considered by their appearance that these women companions were not home loving housewives. It is like a beehive of activity at the house. The plumbers have almost everything roughed in and hope to have the inspection done as early as tomorrow. The heating and a/c crew has most of the heating ductwork in and is working on the cold air returns. We will have heat in areas that had none before. Like our entry way which relied on warm air from the hallway and living room. The electricians are wiring the garage today and should have that done by tomorrow at the latest. The sheetrockers have most of the main floor taped and mudded and may start applying texture tomorrow. When dry we may be able to start painting. The carpenter and I have a plan for buillding a soffit around the ductwork. We also have a plan for installing the exhaust fans in the workroom. Next step will be to get the floor leveled in the rest of the basement and then start installing flooring upstairs to get ready for kitchen cabinets and cabinets in the laundry room and workroom in the basement. The Whiskey runners made a lot of money and made it in a hurry. They were flashy dressers, sporting big diamonds, silk shirts, fancy ties and suits. They were also big tippers. One night in Minot a group of them lined up and peppered a bass drum in a Minot dancehall orchestra with silver dollars. The group was trying to break the head of the drum. They eventually ruined the drum but the orchestra was not upset as they got to keep all the silver dollars. A Whiskey Six was the name given to the big, high powered automobiles used by the booze runners in the days of Prohibition. The favoured car at the time was the Buick. Minot was a local point for the Whiskey Runners in the era of 1919 to 1921. The whiskey running was at its peak during this time. Minot was the last major stop before Canada. The whiskey runners at times would travel in packs with a pilot car ahead to warn the if any lawmen were waiting up ahead. On some days, a whole city block would be lined with “whiskey sixes” waiting for dusk to make their run for the booze. They seldom returned to Minot after getting the load as the main destination was points like St Paul, Minneapolis, Sioux City and Omaha.